Gorkha District, the epicenter of April 2015 massive earthquake completely destroyed 495 schools including 3092 class rooms of Gorkha (DLPIU, Gorkha). Immediately after the earthquake, representatives from Good Neighbors Japan and Good Neighbors International Nepal along with a team of engineers visited the affected areas to assess infrastructural damages. 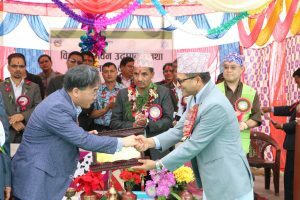 Under its Disaster Risk Reduction (DRR) Plan for Gorkha in Dec 2015, GNI Nepal signed a Memorandum of Understanding (MoU) with Ministry of Education to reconstruct six schools in the district. 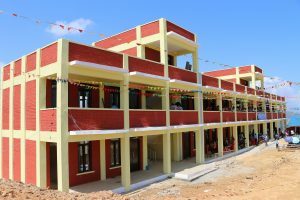 Under the Hope Letter Project of Gorkha Reconstruction to reconstruct two – Shree Sthanika Basic School and Dhungegade Basic School, On 6 June, 2018, upon the completion of construction of 10 roomed school building of Dhungegade Basic School facilitated with gender-friendly toilets, computer lab with specially supported by the Ministry of Education, South Korea and furniture was handed over by Country Director of GNI Nepal – Mr. MinHo Choi along with Chairperson of System Development Service Centre (SDSC) Mr. Bhuminana Devkota to the School Management Committee (SMC) Chairperson & District Coordination Committee In-charge Mr. Ashok Kumar Gurung. A vote of special gratitude was expressed to Mr. Surya Bahadur Thapa, Mr. Jit Bahadur Ale, Mrs Dev Kumari Ale for their land donation for the construction of the school. The School building is expected to serve 82 students of Grade 1 to Grade 8. The construction of Shree Sthanika Basic School is expected to be completed for handover in July this year. 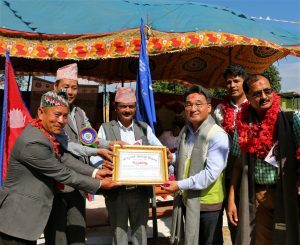 Under the Hope Letter Project, Shree Halhale Basic School of Modi Rural Municipality-4 of Parbat District- completely damaged during the earthquake of 2015, was handed over in a grand ceremony organized by the School Committee and local community people with the Chairperson of National Assembly Honorable Mr. Ganesh Prasad Timilsina, the school building of four classrooms with gender-friendly toilets re-constructed with financial support from Akaihane Kyodo Bokin (Japan) and financial and technical support from Good Neighbors International in presence of Chairperson Modi Rural Municipality, government officials, Satoshi Koizumi, Executive Director Good Neighbors Japan, Min Ho Choi Country Director of GNI Nepal, Chairperson- SORDEC, and media persons. The building will serve 84 students of grade 1 to 8. 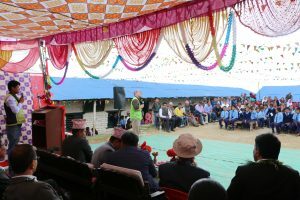 Speech by Executive Director of Good Neighbors Japan at Shree Halhale Basic School, Parbat District.